I know you are probably thinking, “Do you seriously think you’re going to get this pacifier away from my child?” I know at one point, I was thinking this. I mean really. 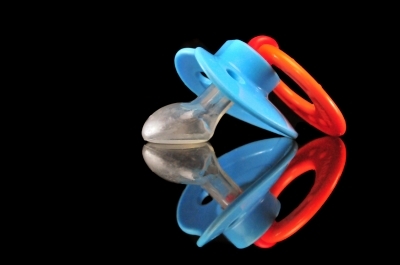 The American Association of Pediatrics recommends pacifier use cessation by 6 months of age. ARE YOU KIDDING ME? Anyone who has had a baby use a pacifier can surely attest how difficult it would be to just take away a pacifier from a 6 month old. Even if your baby is not sleeping through the night by then (and neither of mine were), who wants to deal with the added difficulties in putting their child to bed without something that they’ve grown accustomed to using as a comfort device to fall asleep? Don’t get me wrong, I tried to take the pacifier away from my first son at 6 months. I tried. He won. And it’s not really that my reasoning ability was not good, or that he was the “boss” of me, it’s just that… he wasn’t sleeping through the night yet and I was tired and I quickly grew weary of the additional wakeups combined with longer-than-usual coaxing back to sleep. So I gave it back after 2 nights. Thankfully, the American Academy of Pediatric Dentistry has a different recommendation, that pacifier use be discontinued by age 3 to prevent changes in dental occlusion. So, fast forward 17 months later. It was about a month before his 2nd birthday. He had recently started to fight our bedtime routine. I was on my 3rd round of going in and fetching his pacifier from behind his bed when I finally decided “enough is enough.” I strolled into his room, flipped on the lights, and excitedly explained to him that there was an ambulance here with the “Binky Fairies” who were here to take all of the pacifiers to the hospital for the new babies who needed them. I’m thankful for these 3 things that helped this method: #1 that he had a baby brother born when he was 16 months old so he knew that babies used pacifiers, #2 that his 2nd birthday was coming soon and he was going to be a “big boy” and no longer a baby and #3, that he didn’t ask to look outside and see the ambulance. I grabbed a bucket and started searching his room for all the pacifiers. I placed them all in the bucket, told him “I’ll be right back!”, left his bedroom, stashed them in my bathroom, and came back. He just sat there, stunned. We talked for a few minutes about the pacifier fairies and the babies, and about why they needed them and he didn’t. There were very few tears. He had a little bit of trouble going to sleep that night but he fell asleep nonetheless. He asked for his pacifiers for a few nights but eventually forgot about them. And thus, the pacifier habit was broken. Now, I’m not saying that I know this method would work for everyone but I thought I’d share it because it worked for us and we are still pacifier free. I think the key to this is to do it when they are old enough to understand, yet still gullible enough to believe such a fantasy story, and he was. Of course the best way to prevent having to take the pacifier away is to not use one in the first place…but for me, they were a lifesaver. As a nursing mom, pacifiers allowed me to still have the freedom to get things done without having a baby attached to me all day long. Plus, I am a huge worrier and pacifiers are said to decrease the risk of SIDS by keeping babies’ airways open. So yes, I am a huge pacifier proponent. A couple of other pacifier “rules” that we implemented from the very beginning might have helped too. Pacifiers were pretty much used for naps and bedtime only. There was always one in the diaper bag for emergencies and sometimes they were used on car rides, but during play time and most of the day there are no pacifiers around. My 9 month old, Gavin, now uses a pacifier this same way. Naps and bedtime. Occasionally during sleepy times if we are out to eat too late at night just to keep him calm. As he gets older we will ask him to leave his pacifier in his bed upon waking, just like we did with his brother Quinn. I hope this helps at least someone!